As a paintings conservator, I apply chemistry on a daily basis. For instance, when removing a varnish, I rely on the difference in molecular properties of varnish and paint to dissolve an aged and discoloured varnish without harming the paint. Without knowledge of chemistry and of materials, conservation would be no more than trial and error, and as a result, paintings would suffer. The importance of knowing what is what in conservation was recognized early on in its history. Robert Dossie, apothecary and author, who in his 1758 Handmaid of the Arts wrote about the cleaning of paintings, stated: ‘As a painting may be […] fouled with a variety of different kinds of matter, many of which will not be dissolved, or suffer their texture to be destroyed by the same substances, it is necessary to know what will dissolve or corrode each such kind’ (Dossie: 218-219). In seventeenth- to nineteenth-century recipes to clean oil paintings, many details can be found about the way people thought about and performed cleaning. As these cleanings influence the current state of paintings, they have a direct relevance for my conservation practice: conservators often encounter damages in paintings that result from early restoration. Knowing the nature and effects of historical methods helps me keep paintings safe. But recipes offer more, they help me picture the circumstances under which the paintings we now admire in collections were kept and cared for, and they provide insight into who were involved in their care. 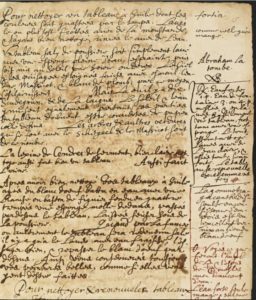 Considering the role of chemistry in conservation, it is not surprising that authors of historical restoration recipes include chemists, apothecaries and other scientists. 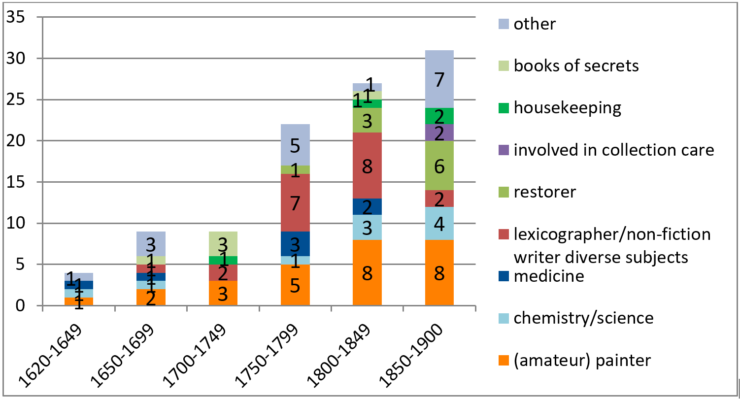 Counting the professions of authors who published restoration recipes in my collection of historical restoration recipes, I see them appear throughout the period I study (Figure 1). Although not the largest category (= painters), there is an obvious interest. Which role were chemists playing? Figure 1: professions of authors of conservation/restoration recipes in NW Europe, 1620-1900. Numbers provide information on the number of books within each category. 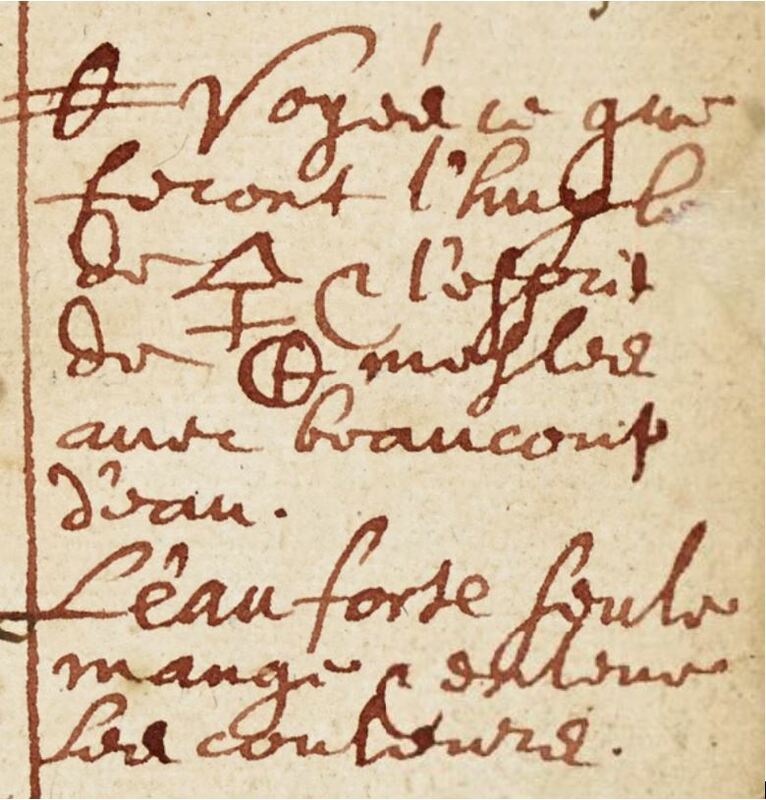 Theodore de Mayerne, experimental physician and author of the manuscript Pictoria, Sculptoria et quaea Subalternarum Artium (the ‘De Mayerne manuscript’), annotated restoration recipes he obtained from artists, for instance a recipe on folio 15r, which he obtained from Abraham Latombé: ‘to clean a painting in oil which colours have been spoiled (gastée) by time’ (Figure 2). 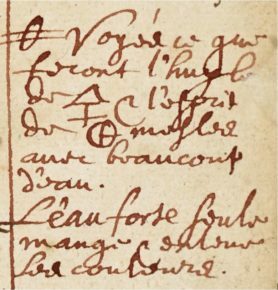 De Mayerne’s margin annotations discuss alternatives to the recipe and ideas, such as ‘see what oil of sulfur and vitriol [sulfuric acid] mixed with a lot of water are good for; aqua fortis alone eats out the paint and removes it’. (‘Voyez ce que feront l’huyle de [symbol] & l’esprit du [symbol] meslee avec beaucoup d’eau. L’eau forte seule mange & enteme les couleurs’) (detail Figure 2). Authors are not all positive about professional restorers. Dossie, for example, commented that cleaning of pictures ‘has been very little understood even by those who profess to practise it’ (Dossie 1758: 218-219). If we may believe Max von Pettenkofer (1818-1901), Bavarian chemist, hygienist and publisher of Über Ölfarbe. Conservierung der Gemälde-Galerien durch das Regenerations-Verfahren (Braunschweig 1870), in his time restoration rested on ‘pure empiricism and false principles’ (‘auf roher Empirie und vielfach auf falschen Voraussetzungen’, page 2). Pettenkofer described how restorers changed paintings into ‘opinion-fed or chance-based copies’, when retouching areas as they ‘think or wish, artist like Titian or Rubens painted’ (‘… und macht sie so, wie man meint oder wünscht, dass z. B. Tizian oder Rubens gemalt hätten. … Man darf nicht daran denken, wie viele Originale auf diese Art schon theilweise vernichtet und jedenfalls unwiederbringlich in Meinungs- und Willkür-Copien verwandelt worden sind’. (Pettenkofer: 13)). Pettenkofer made a huge – albeit not entirely positive – contribution to the history of paintings conservation. Called in by the Bavarian ministry of interior affairs to become a member of a committee to investigate the apparently terrible state of paintings in the Alte Pinakotek Munich and in the Schleissheim Gallery collections, he became the inventor of a method to remedy cracked varnishes that had lost their transparency. His treatment involved exposing paintings to ethanol vapors in a closed-off box, in some cases after exposure to copaiva balsam, a resin from the copaiva tree or Copaifera officinalis, upon which the cracked varnishes would flow together and again form a continuous layer, their transparency restored. His invention was based on – in his own words ‘scientifically established facts about the nature of the technique of oil painting’ (Pettenkofer 1870: 3) and was introduced as an alternative for removal and renewal of varnishes – a treatment Pettenkofer considered very dangerous. It was a huge success, patented in Bavaria and in England, and used on paintings in many North-West European countries. 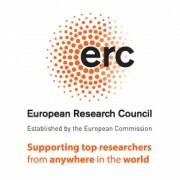 Recent research by Sibylle Schmitt, who writes a PhD about the effects of the Pettenkofer treatment, as it became known, demonstrates that the method dissolved more than just the varnish layer, and may be the cause of degradation phenomena such as tiny mushroom- or ridge-shaped areas of partly dissolved and re-solidified paint, seen by current restorers when they examine paintings with a microscope. (Sibylle Schmitt, Effekte von Pettenkofers Regenerations-Verfahren – Versuchsreihen und Analyse von Malschichtmigrationen an regenerierten Gemälden des 17. Jahrhunderts. PhD dissertation in preparation, Staatliche Akademie Stuttgart/Heidelberg University). The role of chemists in conservation grew considerably during the twentieth century, and chemistry is the foundation of much of the knowledge I currently apply. It helps me investigate and understand techniques and degradation phenomena I encounter in paintings and co-determines my choice of methods and materials. With the development of methods to investigate and monitor ever more precisely the interaction of molecules in paintings, my awareness grows that paintings are small complex ‘chemical factories’ – a term coined by conservation scientist Katrien Keune (Rijksmuseum Amsterdam) – which to me makes them all the more fascinating. 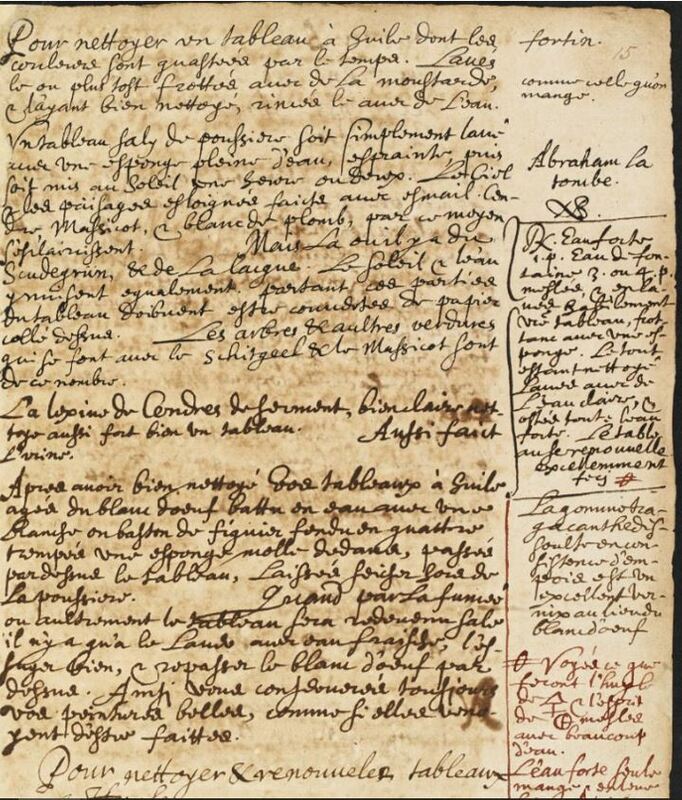 Currently the recipe collection is being studied and extended by Joana Devesa, PhD candidate at the New University of Lisbon (UNL), who investigates recipes to clean oil paintings with ashes and alkaline solutions, under supervision of Leslie Carlyle (UNL) and Maartje Stols-Witlox (UvA).